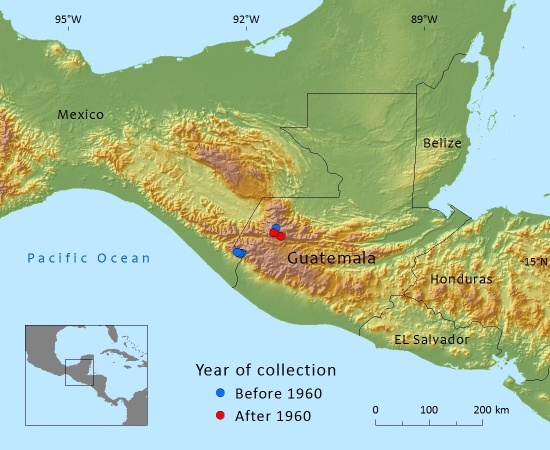 Mexico: Chiapas (Volcán Tacana); Guatemala: Huehuetenango, San Marcos (highlands). The serious decline observed at least since its description (1943) is, if taken over ca. 90 years (3 generations) greater than 70% and places this species in the category Endangered. The decline is also continuing, while the AOO is very small. Adams (2011) surmised that it might only be Vulnerable because its high altitude habitat is less likely to be disturbed. The cutting of trees has been severe, however, according to a report by Islebe (1993). This species is geographically restricted to an area of ca. 700 km2 (in two separate locations), but within that range less than a third of the original stock historically present remains (Islebe, 1993). The scarcity has led to municipal boundary disputes. Official permission is now needed to cut the trees (shrubs are not used) but the local inhabitants largely ignore this rule. In the rainy season there is extensive sheep grazing on the altiplano, which prevents successful regeneration. The specimens at highest altitudes and in rocky places difficult of access may be less vulnerable to these threats (Adams, 2011). This species is in urgent need of protection. Rules and regulations that cannot be enforced are not helpful. Perhaps the establishment of one or two reserves on either side of the border, or an “international” reserve including a significant part of the population, would be a better option. Adams, R.P. 2011. Junipers of the World: The genus Juniperus. Trafford Publishing Co., Bloomington, Indiana. Farjon, A. 2005. A Monograph of Cupressaceae and Sciadopitys. The Royal Botanic Gardens, Kew. Farjon, A. (2013). Juniperus standleyi. In: IUCN 2013. IUCN Red List of Threatened Species. Version 2013.1. . Downloaded on 06 July 2013. Islebe, G. 1993. Will Guatemala's Juniperus-Pinus forests survive? Environmental Conservation 20(2): 167-168. Standley, P.C., Steyermark, J.A. and Williams, L.O. 1946. Flora of Guatemala. Fieldiana Botany 24. Zanoni, T.A. and Adams, R.P. 1979. The genus Juniperus (Cupressaceae) in Mexico and Guatemala: synonymy, key and distributions of the taxa. Boletin de la Sociedad Botanica de Mexico 38: 83-121. A.Farjon, 2015. Juniperus standleyi, from the website, Threatened Conifers of The World (http://threatenedconifers.rbge.org.uk/taxa/details/936).